News just in! As a nation, we are spending more and more time in the bathroom. Over the course of their lifetime, it is estimated that the average person spends around 2 whole years in the bathroom. It is also the first place we start our day and the last place we finish it. If you’re in the market to make some changes to your bathroom this year, at Doug Cleghorn Bathrooms, we have you covered. Whether you crave a touch of spa-like indulgence or if your lifestyle calls for a more modern, family-friendly space, here are 10 inspiring bathrooms trends to look out for in 2018. Bathroom gadgets are becoming increasingly popular of late with smart bathroom technology now being able to control anything from your water temperature to your favourite playlist. We actually fitted a smart shower in one of our most recent projects which means that our customer can switch on their shower, without getting wet before the water warms up. Effective mood lighting is also a great way to enhance your designer bathroom this year. What’s not to love about Herringbone tiles? A follow-on from the metro tile of last year, herringbone tiles are seriously sophisticated and the look is actually really easy to achieve. Recreate this stylish bathroom trend by using plain or coloured tiles for an effect that bears a striking resemblance to classic parquet flooring. They say fashion always comes full circle and when it comes to storage they are most certainly right. Bathrooms with great storage facilities are very much back in, with minimalism taking a back seat and practicality, centre stage. There are, of course, many ways to include stylish storage in your new bathroom design and Utopia I line Furniture in Midnight Grey Gloss is one of them. Proving to be a popular option for larger bathrooms, a matt finish shows up fingermarks much less than it’s gloss counterpart. Opt for matt finish bathroom cabinets in a muted grey-blue for a look that blends effortlessly with natural finish tiles. One of the biggest bathroom trends to watch out for this year is bold and daring, statement flooring. Because the floor space of your bathroom is usually much smaller than the wall, flooring is much easier to replace than wall tiles and therefore more efficient to experiment with. Take a look at our recent project where we used standout Utopia Bohemian Blues floor tiles along with white wall tiles for a look that packed a punch. We recently covered his and hers sinks in our other blog post; why not have a read of the article here. Offering a great solution to combat the morning rush, also on the horizon for this year’s bathroom trends are his and hers showers. Smart technology may be on the rise but bathroom decor is going back to basics with natural and raw materials being extremely favourable this year. The best way to work this pared-back look is with beautiful wood effect tiling. Wood effect bathroom tiles are a great idea because they give a lovely, organic finish yet they stand the test of time. Add a sense of character and drama to your new bathroom through the use of bold accents. Check out our recent project for instance where we created a feature window of gold mosaic tiles. A striking addition to the bathroom, it was a real labour of love and took our installer half a day to create. Coloured baths and basins are also making a comeback but don’t worry, avocado green still belongs in the 1970s. First, they invaded our kitchens and now they want our bathrooms. Warm metallics such as brass and gold are here to stay for 2018 with just a hint of these stylish alloys bringing another level of opulence to the modern day bathroom. Pair crisp white furniture with brass or gold accessories for bathroom indulgence that isn’t gaudy. 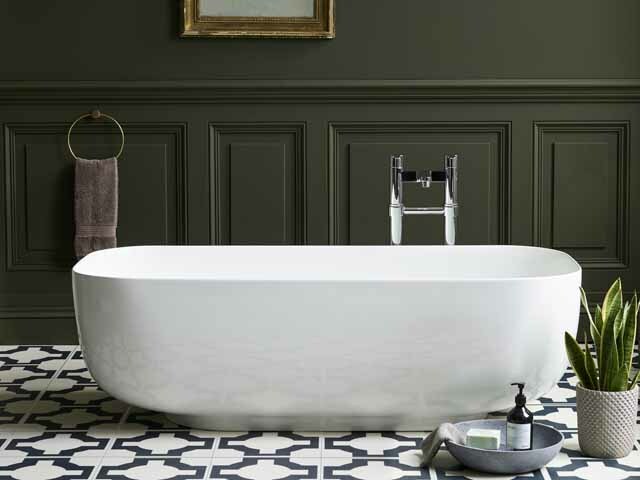 Last and by no means least, our star of the show and taking centre stage in the modern bathroom this year is the beautiful freestanding bath. A stunning focal point and the most elegant of places to unwind, the indulgent standalone bath has got to be one of our favourite bathroom trends of this year. We hope you have enjoyed reading our latest blog based on some of the most inspiring bathroom trends of this year. At Doug Cleghorn Bathrooms, we are proud to be a customer focused, family business, with a passion for exquisite design and product innovation. Our Leeds showroom is stocked full of beautiful bathroom products and accessories and a one-stop shop, all of our projects are fully managed by us. We also have 25 year (lifetime) guarantees available on some of our products including working parts. For expert advice on how you can work the bathroom trends for 2018 into your home, our luxury Leeds based showroom holds inspiration aplenty. Do pop by and see us soon!